Companies engaged in formulation science and technology are faced with many challenges when they need to extract meaningful information from a multitude of sources. iFormulate4Knowledge is a new service which allows you to extract, visualise and summarise information in a simple and cost effective way. IFormulate4Knowledge can index scientific publications from all collections including patents, social media, web pages, internal corporate documents, emails and so on. In fact any electronic documents can be analysed this way. Another important feature is that the outputs, which may be many in number, can be exported into visualization tools to give the reader an overview of the content, topics and key themes in the data set. 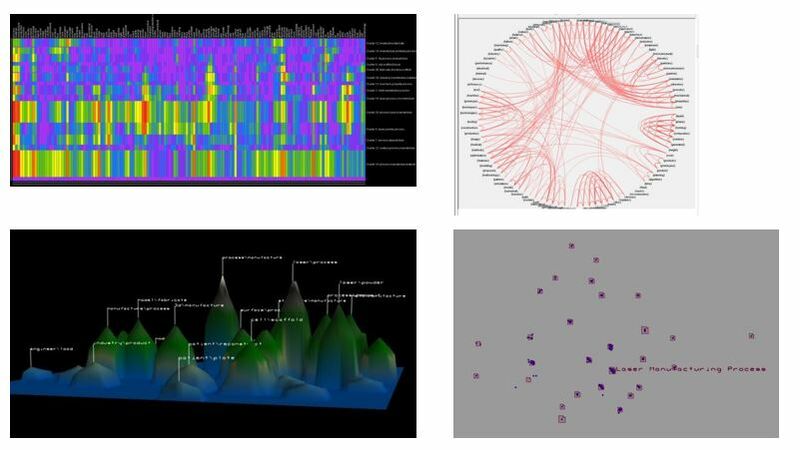 Some examples of the types of visualisations we use are shown above. Accessing this bespoke service is straightforward. In the first instance, we hold a conversation with you over the phone to understand your area of interest and what sources of information would be of most interest to you. This can be under a confidentiality agreement if required. We then go away and extract the information.